Any digital processor needs a clock. On every clock cycle your processor will do something. Faster the clock, the more things your processor will do. Modern microcontrollers all have built in clocks, however this tutorial will show how you can add a much faster external one to soup up your processor. I'm not going to go into details of each. The silicon oscillator is the type built in to your microcontroller - free and easy, but not very fast. The RC and ceramic oscillators have advantages that you can google up. You however want to use the crystal unless money or board space comes up at a huge premium. If you are a hobbyist, or generally don't know what you are doing, I recommend the crystal hands down. Bear in mind that a crystal can look like any other chip, too. But most often you'll see it right next to a microcontroller with two capacitors next to it. I'll now go into how you can add a crystal to your microcontroller. If you plan to use UART for say USB or TTL data transfer, you need to decide on the operating frequency you wish to use now. The reason for this is different crystal frequencies are optimal for different baud rates (9600bps, 115.2kbps, etc). Now open up that ~500+ page microcontroller datasheet. Don't worry, I won't make you read more than ~5 pages of it! In that chart you'll see an error percentage. It depends on your external hardware, but generally don't count on your UART working at that baud rate if error is above about ~3%. 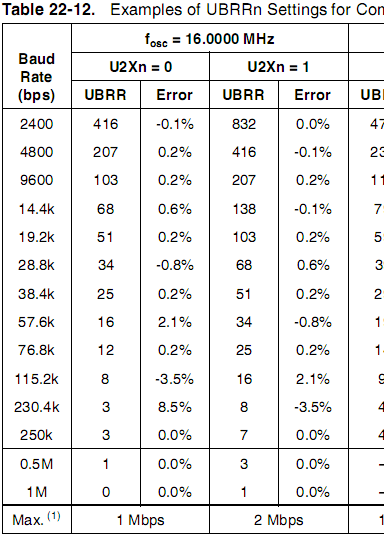 It has to do with rounding errors, but lets not get into details . . .
Search around, and in the datasheet you'll see something like: "Low Power Crystal Oscillator Operating Modes". Now in this chat you'll see two important things. On the left is the frequency you want, which for most cases you want to be as fast as possible. Lets assume 16MHz and that UART error is acceptable for you. Now on the right is a table that matches frequency with acceptable crystal capacitance. Thats right, you'll need two capacitors that match up to your crystal. It'll say something like 'Recommended Range for Capacitors C1 and C2 (pF) 12 - 22'. This means you can use any capacitor from 12-22pF. Now go to your favorite online parts store, like mouser.com or digikey.com. Search for crystals. You'll get an option that says 'Load Capacitance'. The load capacitors on your circuit must be ~2x this value. 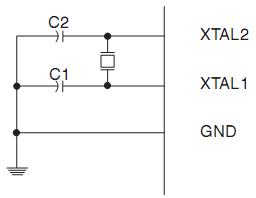 Remember, this capacitance has to be within range of the value in the microcontroller datasheet. The stability tolerance of a oscillator needs to be specified, along with the operating temperature range. For instance, a crystal may be specified as having a frequency stability tolerance of 50 PPM over an operating temperature of -45C to + 85C, and having a frequency tolerance of 50 PPM at +25C. Anyway, now that you know you need 18pF capacitors, go buy two small ceramic caps as well. Make sure the caps are super close to the crystal, and the crystal super close to the microcontroller. This is so to reduce electrical noise and internal capacitance that could mess up your clock. 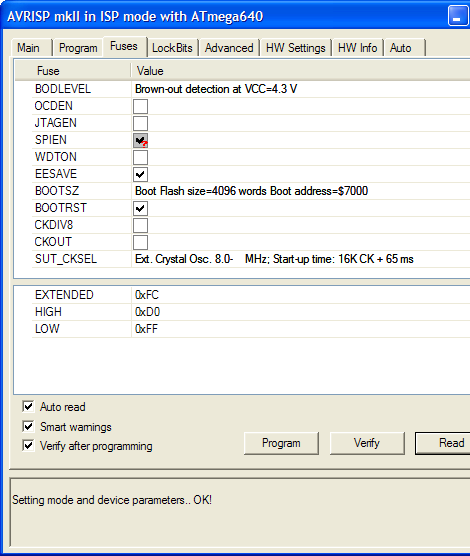 Now that the hardware is done, you need to change the clock fuse settings on your microcontroller. Now be VERY careful, if you mess this up, you'll probably brick your microcontroller (meaning you need to buy a new one). Make sure its 'Ext. Crystal Osc.'. Don't worry about not defining the speed, the crystal does that. The start up time can be whatever, but I prefer making it slow for my applications. Oh, and in your software, don't forget that since your clock is much faster, you'll have to reprogram stuff like for your servo PWM. Anyway, enjoy your souped up microcontroller!